While each of these avenues has pros and cons, this article focuses on the issues associated with investing through REITs and the comparative benefits of investing through an emerging alternative – online investment marketplaces, or as you’ve probably heard them called, real estate crowdfunding platforms. 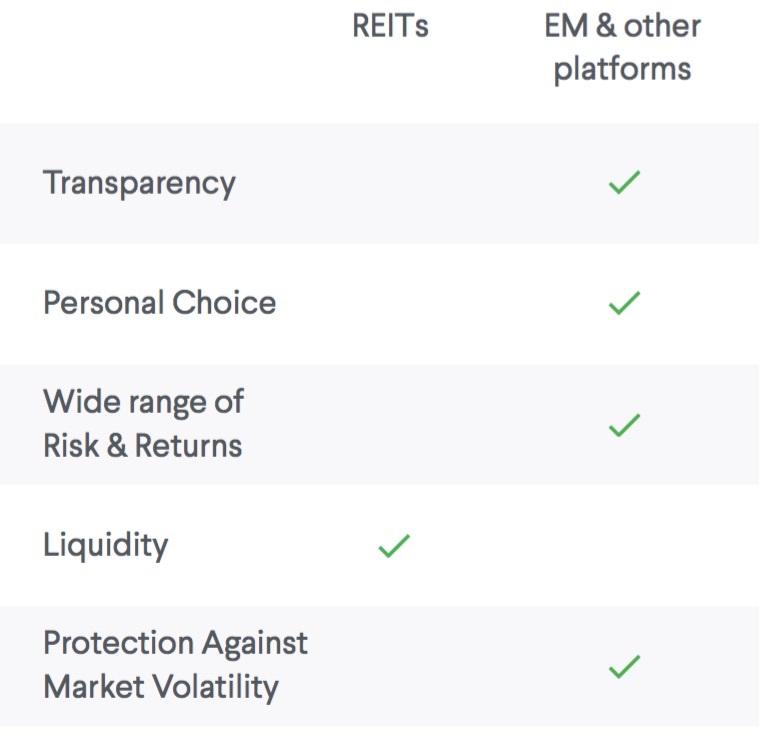 REITs offer easy access to centrally operated real estate portfolios, which make them a popular choice for investors looking for real estate exposure but lacking direct investment access and unwilling to invest the high minimum amount required by private equity funds. REIT returns are also compelling, particularly in the current low interest rate environment. 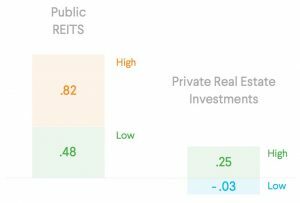 Despite the solid overall returns, public REITs are characterized by sometimes extreme market volatility. In 2010, as public REITs shook off the effects the recession, annual returns ranged as high as 27.5% but in 2013, with the U.S. real estate market booming, returns sagged to 3.2%. 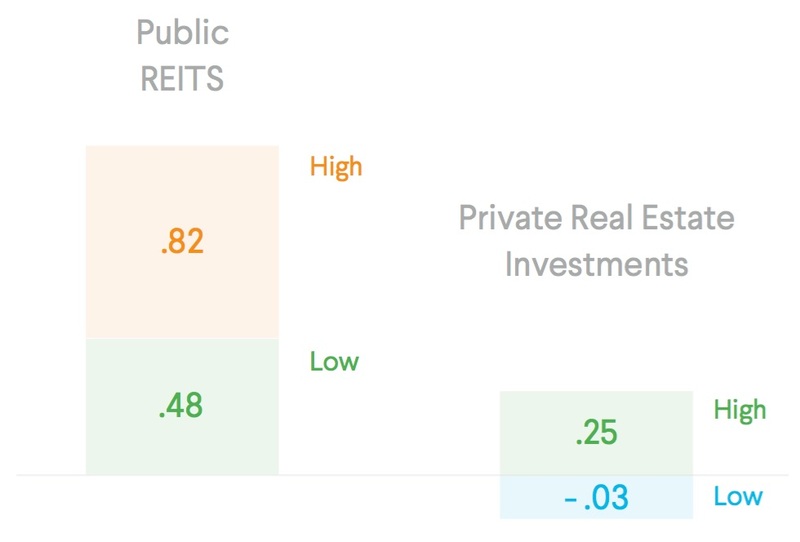 Rather than being strongly correlated with the value of the underlying real estate, the recession revealed that REITs are, in fact, strongly correlated with the public markets. This correlation undercuts the diversification and inflation hedging benefits of other forms of real estate investing. Private real estate investments show a low correlation to the public debt and equity markets (between -0.03 and +0.25) and thus have strong diversification benefits in portfolios that also feature stocks and bonds. accounting scandal that recently shook up ARCP, the world’s largest REIT, money has poured into these vehicles. In 2013, privates REITs raised a record $19.2 billion. That number receded in 2014 to $15 billion in the face of increased criticism and with the rise of viable alternatives for investing in real estate. Direct real estate investments, like those offered by EquityMultiple and other investment marketplaces, do not have the market volatility associated with public REITs or the burdensome fees of private REITs. The NCREIF Index which tracks a very large pool of private investment commercial real estate, gives a sense of just how profitable the sector has been. With the notable exception of 2008 and 2009, annual returns h2ave been above 10% each year since 2004 and ranged as high as nearly 19%. The returns offered through real estate investment marketplaces will vary widely depending on the underlying asset, the risk profile of the business plan and the structure of the investment. Stable, cash flowing assets with major tenants on long leases may produce a yield more similar to a risk adjusted bond, while value add and ground up development projects offer far higher returns because of their significantly different risk profile. Part of the power of investment marketplaces is they allow sophisticated investors to make their own decisions about what assets are right for their portfolio. REITs face limitations in how and what they can invest in by virtue of both their size and structure. 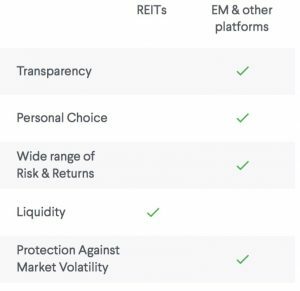 While investors may know a REIT’s strategy, they generally will not be privy to any particular investment decisions. The bottom line is that your portfolio may have room for both REITs and marketplace investments because they serve different purposes. REITs offer solid returns over the long term, ease of investment and a degree of liquidity but some of the advantages of investing in real estate are mitigated by that very liquidity. Real estate investment marketplaces empower you to find a real estate investment opportunity that matches your goals, whether you’re looking for a stable cash flowing deal for diversification or a value add deal with the possibility of portfolio boosting returns. This represents a significant innovation in real estate investment, modernizing an offline process by bringing it online. Note: while the concept of individual investors participating in large real estate projects is often referred to as “real estate crowdfunding”, the term legally means employment of Title III of the JOBS Act, which enables marketing of assets to non-accredited investors. Thus, EQUITYMULTIPLE is not technically a crowdfunding platform, but rather an investment platform for accredited investors.